Well, my quilt wasn’t a winner in the eyes of the the Modern Quilt Guild (MQG) (congratulations to Jill and the two other winners), but in the eyes of the quilt’s new owner, I made the best quilt ever (though I was told that a couple of fire engines would have improved things just a little). 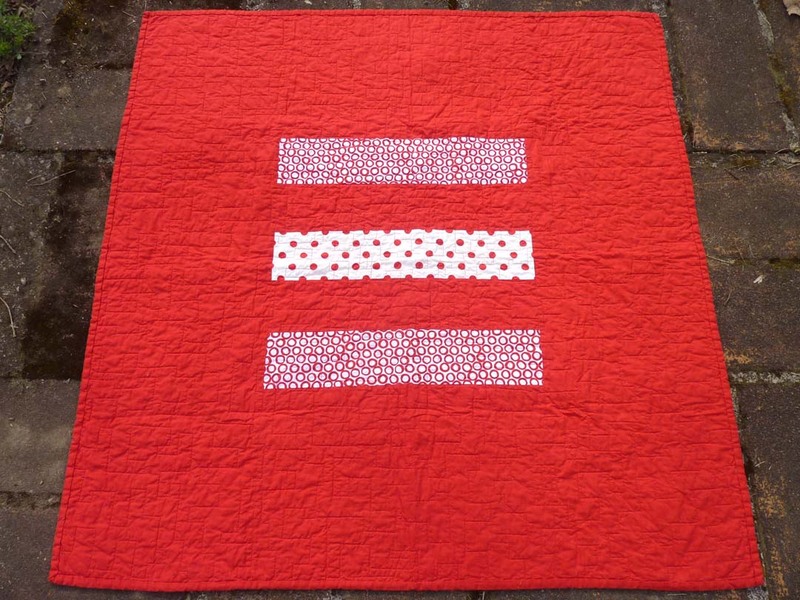 I was hesitant about creating quilt for Challenge 2‘s monochromatic theme. I took some rather monochromatic colors to my first quilt class with Lupine, one of the owners of Modern Domestic, and she told me that I should pick colors that would “pop”. I ended up buying a fat quarter bundle at Bolt, which is where the Doll Quilt class was held, and I did create a tiny quilt with colors that do pop and I really like the result (that quilt is still waiting for quilting and binding). I have learned a lot since in then about how to broaden my approach to selecting fabrics for my work. The monochromatic challenge seemed to be going a little backward. But, I decided that I have learned a lot since I started that first quilt about two years ago and that this challenge would be a good skill-building exercise. There is one person in my life who has a monochromatic passion…. Henrik loves everything in red so I decided to pick red. I made my first quilt for his cousin so it was his turn. 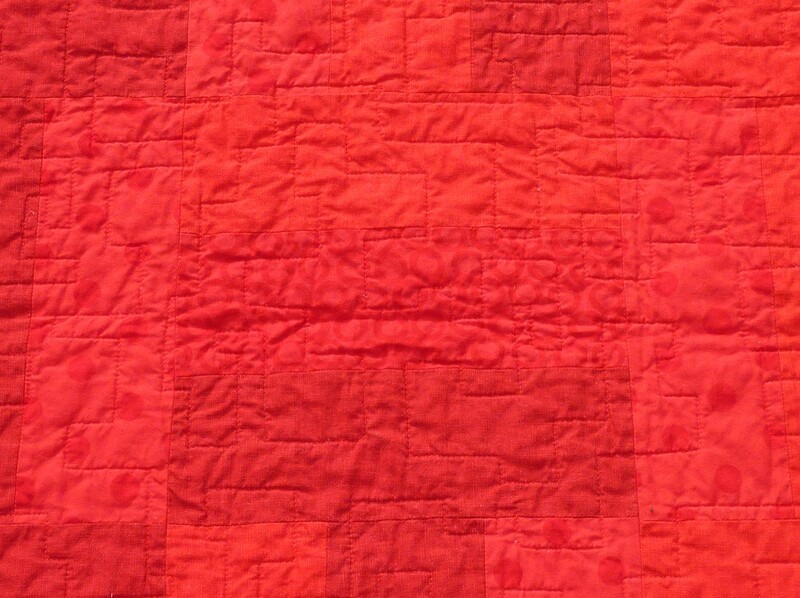 I had no idea then what a challenge the color red would become throughout this quilt’s evolution. 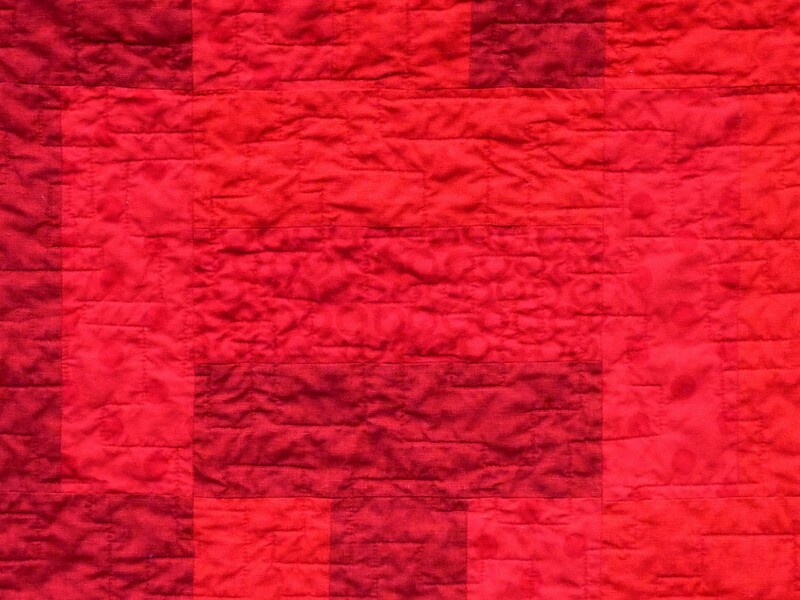 I discovered Robert Kaufman’s Quilter’s Linen while working on the still incomplete quilt for Challenge 1. 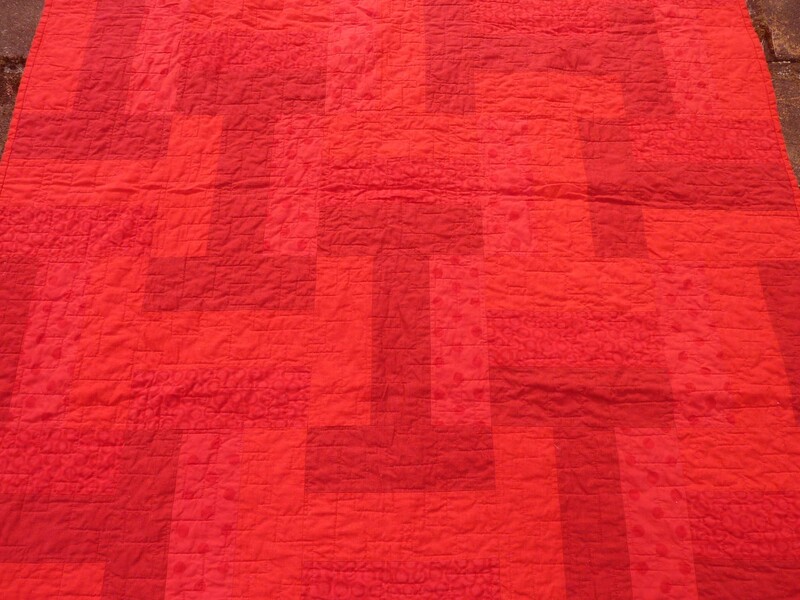 I started with the Quilter’s Linen Red and Crimson for this quilt. From there I met some of my first challenges. Finding additional red fabrics that would coordinate/compliment/contrast was pretty difficult. Using any neutral colors was discouraged by the MQG so I decided the best way to move forward was to pick white fabrics with red prints and then dye the white background and make them red. Elizabeth Hartman gave a great tutorial on dying basics at one of the Portland Modern Quilt Guild (PMQG) meetings a while ago and I been wanting to try it out. I bought Malka Dubrawsky’s book Color Your Cloth: A Quilter’s Guide to Dyeing and Patterning Fabric after being inspired by Elizabeth. 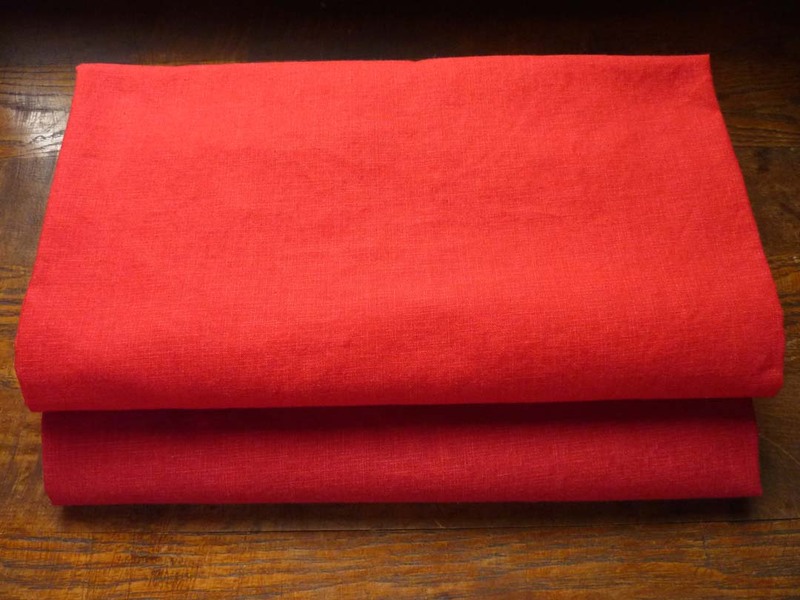 I picked out four red print fabrics. Then I picked out True Red, Fire Red and Crimson dyes from iDye and did some trial runs in the washing machine. I also tested out bleach discharge, but I did not like the results. 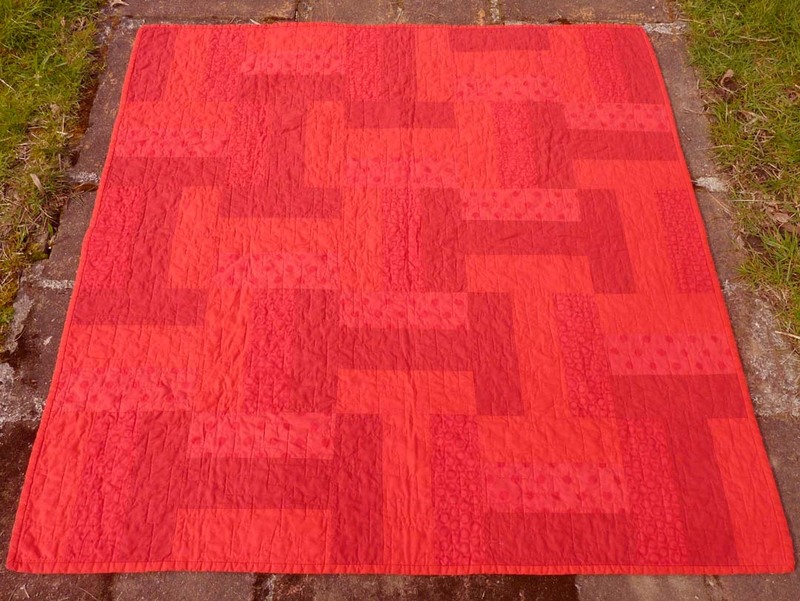 The True Red worked best with the Quilter’s Linen. I did turn a load of whites slightly pink, even after a bleach discharge load. I decided to dye the four print fabrics on the stove. I am not sure if too much fabric in the pot was to blame, but I did not feel like to dye took as evenly as it had in the washing machine. I hesitantly redyed in the washing machine, but I still had some areas that were not as even. I had just enough fabric that I was able to cut around the lighter sections. I eliminated the print with the smallest dots right away because I did not like the way the dots looked after the dye process. They seemed lighter than the background fabric, almost white. I then planned on improve piecing with the remaining three prints and two colors of Quilter’s Linen. I knew that I wanted to work with three strips of fabric per block because I knew that Henrik would like that. We are a family of three and he sees patterns of three everywhere. 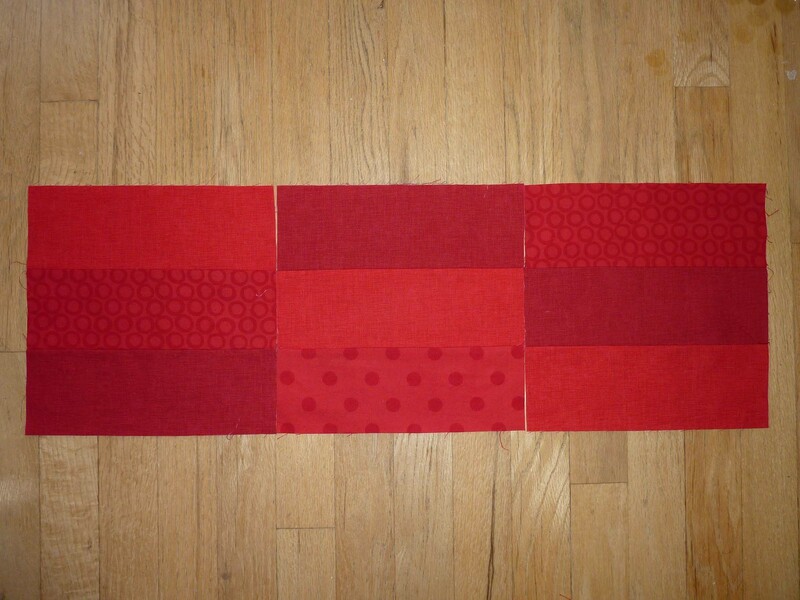 I picked fabrics out of a pile with my eyes closed to make up five blocks per row that would each be 9”X9”. I went through this process twice and I liked about 75% of the quilt, but there was a section each time that I really did not like. I also realized that I did not like the way that the color of the dyed Monaluna Cobblestones worked with the other fabrics. That fabric and the Monaluna Rings were my two favorite prints so I was sad to eliminate it. Now I had two prints and two solids. I didn’t think there would be enough variety to pick blind so I came up with a pattern. Each block would get each of the solid colors and one of the prints. I alternated the prints every other block. I then rotated each fabric from top to bottom as I moved from left to right across the quilt. 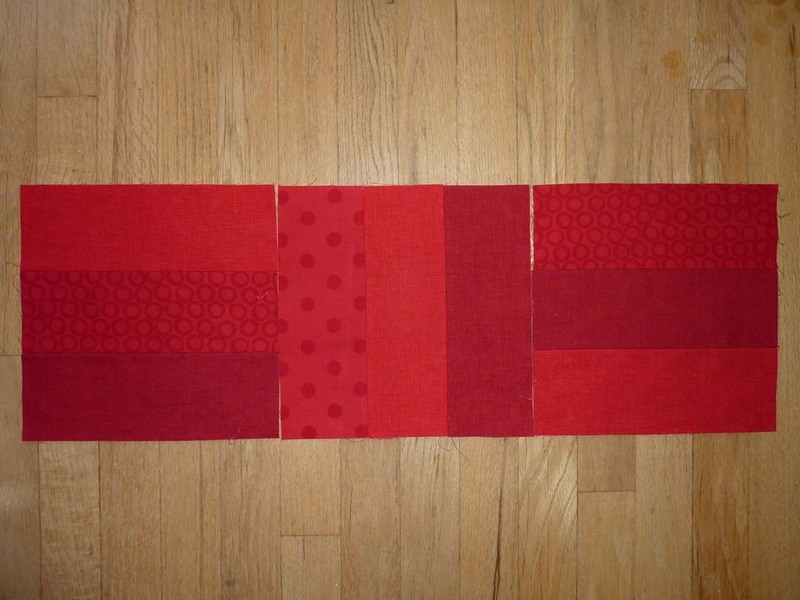 The red Quilter’s Linen started at the top of the first block on the upper left, then moved to the middle and then to the bottom. I decided to make it more interesting by rotating every other block clockwise one rotation. I stood up on a chair to get some perspective on the blocks on the floor and a pattern jumped out at me. There were “H”s everywhere on the quilt. 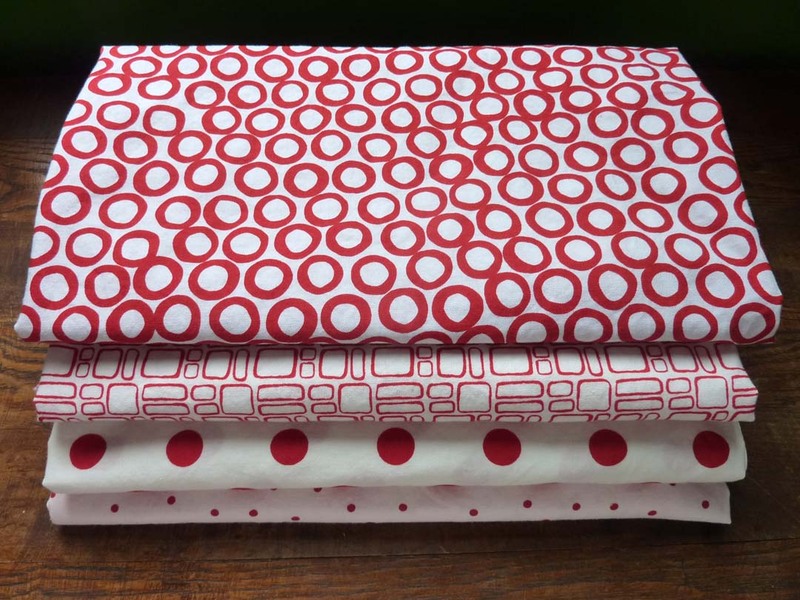 The ones that show up best are with the Crimson Quilter’s Linen. Since the quilt was for Henrik I decided to stick with the pattern and sew the blocks together. Everything went as planned and I was ready to quilt. I spent more than twice as much time ripping out the stitches as it had taken to make them. So, I decided to improve some right angles, sort geometrically (I am not sure if there is an official quilting term for this). Oh, and I had also had trouble with my free motion since I had started on an edge and worked to toward the center. Things got bunched up in the center. I decided to start in the center with my new straight lines with the walking foot. I did like the way it looked after I finished the section. I didn’t have any more time to work on it then, but Rob was going to be home for the next three days and I still had eight days before the end of the contest so I assumed I had plenty of time. I had no idea at the time how outrageous that assumption was at the time. I sat down to quilt the next afternoon and soon realized that my feed dogs were malfunctioning. My machine would only stitch a 6.0. I could only infrequently get it to go in reverse and when it did, it kept going in reverse. Panic started to set in. I raced my machine out to Montavilla, which has almost been my machine’s home away from home for the last year. This was at least my fourth trip since my service a year ago. I had to take my machine in twice during Challenge 1 and it is part of what kept me from completing the quilt by the deadline. It looked like my machine was going to need a new part for the feed dogs and I was not going to get it back that day (I actually still don’t have the machine back because that part did not fix the problem and the root of the problem has not been established). I was not going to be beat by machine malfunctions this time. I had two gift certificates for sewing at Modern Domestic, which I had won here and here. What a blessing! I spent about six hours on Saturday and Sunday quilting on one of their beautiful Bernina machines. Thank you so much to Erica, Meredith and Lupine for all the little pointers in getting me up to speed with the Bernina. It is so much more intricate than my current machine! I was also so happy to have completed the quilting and I was also so happy that my body cooperated with the effort. Neck pain resulting from my car accident last October was the other half of the equation that prevented me from completing Challenge 1. I was supposed to get my machine back on Wednesday so I figured I would do the binding on it. Well, that didn’t happen so I went out to Montavilla and sewed the binding on with one of the machines on the sales floor. I was very thankful to have had that opportunity. I sewed part of the binding on the backside by hand while watching Henrik’s swim lessons and I finished the rest of it late Thursday afternoon. I threw the quilt in the wash, dried it and raced the setting sun to take some pictures. I was not happy with pictures, which I thought were because of the low light. The two quilt pictures above are the ones I submitted for the Challenge 2. 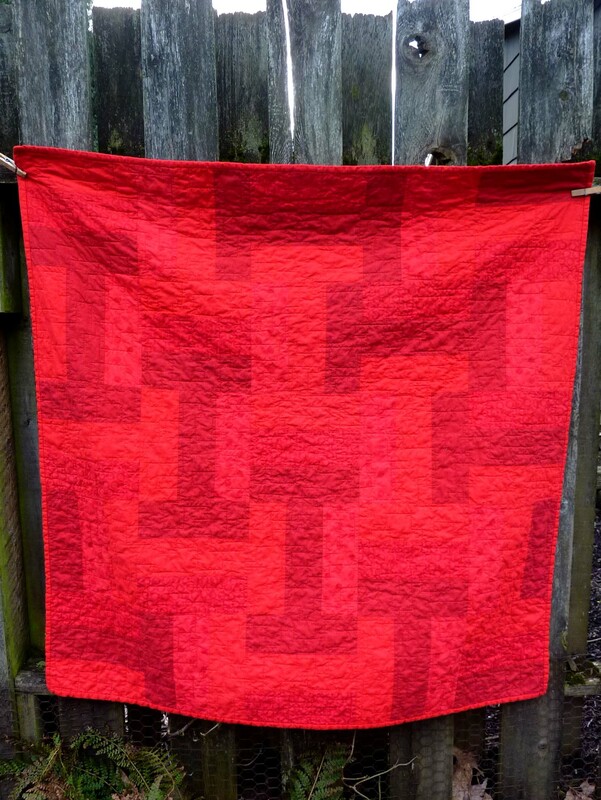 I took these photos a week later, but I still found it very hard to get the photos to look like the true red colors of the quilt. I only had to submit photos of the front of the quilt so I sneaked in the undyed patterned fabrics on the back of the quilt. While I was taking these pictures Henrik asked me, “Were you thinking of me when you made that quilt because it is red and I love red?” He didn’t know yet that it was for him. I got the photos submitted with about five minutes to spare. The winners were announced about two weeks later and I wasn’t one of them. But, when I gave the quilt to Henrik, he made me feel like a winner, except for the whole fire engine comment. Even though I took the first set of of photos in the early evening and the second set of photos in the late morning, neither set accurately displays the range of the reds. So, I guess we will all enjoy it here in person. I was completely resolved that having succeeded in completing Challenge 2 on time was enough for me. But, then Challenge 3 was announced. “Organic” is the word of inspiration. It is like they plucked the word right out of my brain. I have envisioned a great quilt plan already. I have acquired two fabrics for the quilt and I am searching for a few more. I guess I will start cutting the fabric while I wait for the return of my sewing machine. I may be spending a few more hours at Modern Domestic in the near future…. This entry was posted in Beauty, Create, Family, Gratitude, Inspire, Learn, Quilt, Read, Sew, Tutorials. Bookmark the permalink. This entry was posted in Beauty, Create, Family, Gratitude, Inspire, Learn, Quilt, Read, Sew, Tutorials, Uncategorized. Bookmark the permalink.